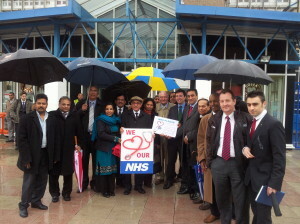 Labour's Mayoral candidate, Ken Livingstone, has been in a very wet Ealing today to highlight the plight of the hospital alongside the Shadow Secretary of State for Health, Andy Burnham. He was joined by Virendra Sharma MP and London Assembly candidate for Ealing & Hillingdon, local GP Onkar Sahota who have been leading a campaign to fight cuts. Four out of nine accident and emergency wards in north-west London will close under NHS reorganisation plans. Under current proposals - which are still being finalised - either Ealing or West Middlesex or will lose its accident and emergency ward. Labour say the Conservative Mayor, Boris Johnson, has failed to keep his promise (pdf pg 17) to stand up for the NHS.